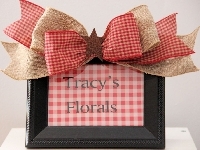 Display your favorite photo in this adorable 4 x 6 country prim picture frame. Accented with red gingham and burlap ribbon and finished with a rusty star. FREE SHIPPING ON THIS ITEM. Approx. ship time: One to two weeks.